Kaarasaaram: Sweet Omlette with Bananas. This is a very easy dessert and very tasty. I would say this is fit for a beginner cook to dish up [like me]. I used grapefruit because I had one lying around without any purpose. 1.Preheat the grill to a high. Slice the bananas. Shell out the grapefruit segments. 2.Beat together the eggs, sugar, cardamom powder and milk. 3.Heat a small pan on medium heat. Melt the butter and pour the egg mixture as you would make a regular omlette. 4.Don't keep moving it or stirring.Let it set. 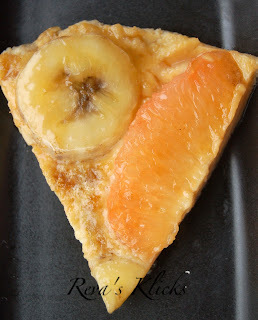 5.When 3/4 set, arrange the banana and grapefruit segments in whatever pattern you want. 6.Sprinkle the muscavado sugar and place under the grill for 3-4 mins until caramelised. 7.Serve hot garnished with a sprig of mint. As usual you can substitute- cinnamon for cardamom, grapefruit for whatever fruit you want, regular sugar for muscavado sugar. The choice is yours. 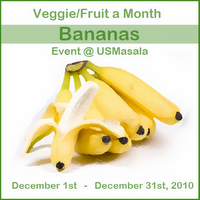 This is for the event " Veggie/Fruit a Month" by Priya of Mharo Rajasthan's Recipes, guest hosted by Aipi of US Masala. Woww great looking sweet omelette..Excellent. This is so innovative! The color is fab and I bet they were tasty.